Once again, in defiance of the self-imposed and oft disobeyed rule, I bought a new cook book on a recent hilarious trip to Dublin with my brothers. I watched rugby, I drank Guinness, I went on a tourist bus trip, all things I don’t do at home. We failed to get to either of the Brother Hubbard cafés (although we did eat loads of excellent food in many other places), but I flicked through the book in the Irish Design Shop and was unable to resist. I’m sooo glad I succumbed – everything I’ve tried so far has been a rip-roaring success. 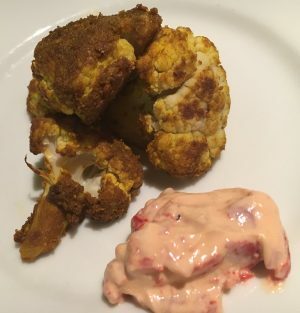 There was this spicy roast cauliflower with a peppery dressing. 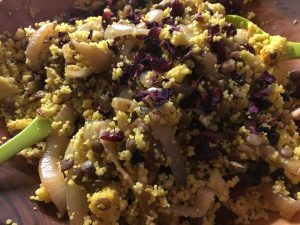 I kept finding reasons to swing by the fridge and dip another floret in the sauce – I LOVE cauliflower and this has a most pleasing kick. And then I made the wonderful beef koftas with wedding couscous. I do like a recipe that you can get on with at idle moments (?) during the day. I made the tomato and pepper sauce in the morning and caramelised the onions for the couscous at the same time. Came back later to assemble the meatballs. And finally finished off the couscous in time for dinner. 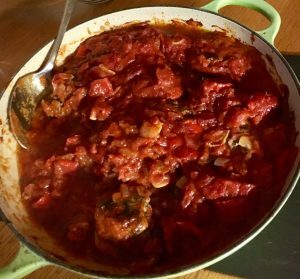 The meatballs and sauce were great and the couscous was stunning – I’m not usually that keen on fruit in my savouries but the addition of cranberries and currants really works. And it’s vegan. Recipe says it serves four – I’d say at least 10… But it keeps really well and I didn’t have to think about lunch for the rest of the week. I’ll post the recipe – it is most lovely. Looking forward to my quinoa and buckwheat delivery. Promising Ottolenghi recipe for buckwheat pancakes!